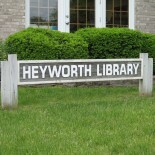 Heyworth Public Library provides public access to two computers for adults and children who are at least 11 years old. Patrons are allowed one hour of computer time per day within library hours and may extend their session if no one is waiting. Computer usage is free. Anyone wishing to use a computer must sign a Computer Use Agreement. A Heyworth library card, driver’s license, or state ID with photo will be required. Children, ages 11 years to 17 years, must have written permission from a parent or guardian. Internet use is monitored and access will be denied if violations of the policy occur. Computers may be reserved up to 24 hours in advance by calling the library at (309)473-2313 and speaking to a staff member. If you miss your reservation time, the computer will only be held for 15 minutes.